Heat oven to 350F. Grease bottom of 13x9 pan. Mix brownie mix, egg, water and oil until well blended. Bake for 20 minutes or until fork is clean 2 inches from sides. Once completely cooled, frost the top of the brownies. Since I used regular peanuts, I took a rolling pin to turn them into crunchy bits. Add peanuts to frosted brownies. Meanwhile, melt peanut butter and chocolate chips over low heat. Add peanut butter/chocolate mixture to 3 cups of rice cereal. Spread over frosted brownies. Refrigerate for one hour or until set before cutting into bars. Oh my Meggie!! These looks yummy!! 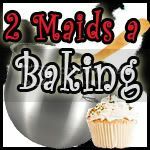 Thanks for linking them up to 2 Maids a Baking!! Great recipe! I'm your newest follower. I hate you for showing me this. I am making it soon...as soon as my bread is gone. These look very good and would tie in nicely with the peanut butter kick I've been on lately. These look super sinful...just my style!! This would be perfect for my Foodie Friday linky party - stop by this week and link up! Wow. Looks so good. Looking forward to following your blog!